The Volvo Concept Coupé with a gas plug-in hybrid engine points toward the next generation of Volvo models, starting with the forthcoming XC90 in 2014. The powertrain reflects Volvo Cars’ strategy to use electrification to create the most powerful versions in the new four-cylinder Drive-E engine family with a two-liter high-performance Drive-E gasoline engine with a supercharger and turbo. The gas engine is teamed with an electric motor on the rear axle. This gives Volvo Concept Coupé a total output of around 400 horsepower and over 440 lb.-ft. of torque.The Concept Coupé also features elements that echo the design of the Volvo P1800 from the 1960s. 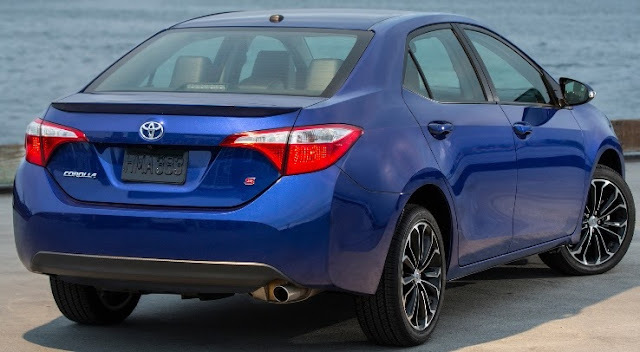 The all-new 2014 Toyota Corolla, offers a 132 horsepower 1.8-liter 16-valve DOHC in-line 4 cylinder engine with VVT-i available on the L (above), LE, and S grades and the new LE Eco trim level is equipped with a 140-horsepower Valvematic 1.8-liter engine. The 2014 Corolla, available in L, LE, S, and the new LE Eco grade models for a total of 12 variants, has a starting MSRP of $17,610 (including destination, processing, and handling fee of $810) for the L grade with a new 6-speed manual transmission. The base Corolla L with 4-speed automatic is priced at $18,210 with features that include LED lowbeam headlamps with LED daytime running lights, standard Bluetooth connectivity, driver and front passenger whiplash-injury-lessening seats and eight airbags, including a new drivers knee airbag and passenger seat cushion airbag. The top-priced Corolla S Plus (above) with 6 speed manual transmission starts at $22,110. The all new Corolla will deliver combined mpg between 31 and 34 depending on model, engine and transmission type. The LE Eco will offer an EPA rating of 42 mpg on the highway. Toyota has a lot riding on this updated version of its Corolla. 2014 Subaru BRZ At $26,390 - Tons of Fun! The 2014 Subaru BRZ 200-horsepower rear-wheel drive sports car configured with 2+2 seating and a folding rear seat starting at $26,390 (including destination & delivery charge), gets an estimated 25 mpg combined with the 6-speed manual transmission and 28 mpg combined with the 6-speed automatic transmission. The BRZ Limited starts at $28,390 for the manual transmission model which includes all performance features, such as the sport-tuned suspension with front strut brace and TORSEN limited-slip differential. The Subaru BRZ and its Scion FR-S sibling are solid, fun cars that remind me of my days behind the wheel of my 1978 Datsun 280Z. Loved that car and love this one! The Range Rover Hybrid and Range Rover Sport Hybrid have three driver-selectable modes and combines Land Rover's 3-litre SDV6 diesel engine with a 35kW electric motor integrated with the 8-speed ZF automatic transmission. 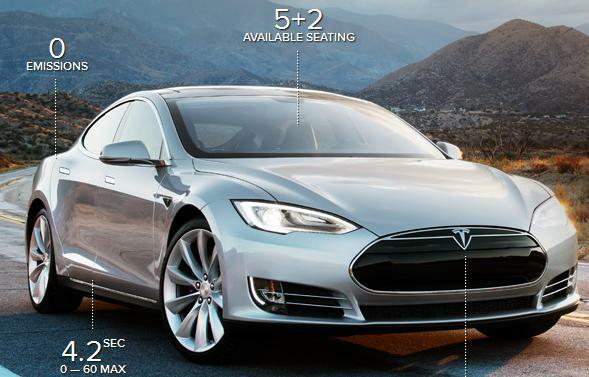 The hybrid system, including lithium ion battery pack, inverter and electric motor weighs less than 265 pounds. Together, output of the diesel engine and electric motor is 335 horsepower with both models accelerating to 62mph in under seven seconds with a top speed of 135mph. The Range Rover Hybrid and Range Rover Sport Hybrids with an estimated 44.1mpg (combined) will be delivered early next year. The Infiniti Q30 Concept is "designed for younger customers looking for an alternative to traditional premium compact vehicles and open to convention-challenging approaches", according to Infiniti, who "is confident this merging of the dynamic design and sportiness of a coupe, the roominess of a hatch and the higher stance of a crossover will resonate with these customers." By appearance, the Q30 seems to be following the FX style cue but where are the door handles? Quite a Mary Kay color, too. The new Volkswagen Golf R sports car with a 4MOTION permanent all-wheel drive is powered by a newly designed 296-horsepower TSI® engine, which is 30 horsepower stronger and up to 18 per cent more fuel efficient than the engine in the previous model and mated to a six-speed DSG dual-clutch automatic transmission. 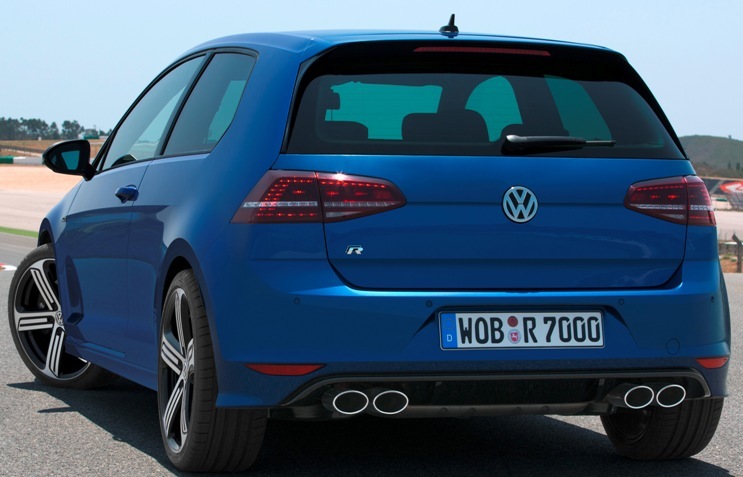 The Golf R reaches 62 mph from rest in 5.3 seconds. The Golf R launches in Europe in the fourth quarter of this year to join the new Golf GTI, Golf GTD, Golf Variant, and Golf TDI BlueMotion which also debuted this year. The 2015 Audi A8 will hit the German market with two gas and two diesel engines when it arrives at German dealerships in November. The 310 horsepower supercharged 3.0 TFSI, the 435 horsepower V8 twin-turbo 4.0 TFSI with cylinder deactivation, 258 horsepower 3.0 TDI clean diesel which gets about 40 mpg and the 385 horsepower 4.2 TDI clean diesel all mated to an eight-speed tiptronic transmission. While the A8 demesions remain the same, the A8 L gains an additional 5.12 inches in both length and wheelbase. In the German market, LED headlights are standard in all models with a V8 engine. The 2015 Audi S8 has a 520 horsepower 4.0 TFSI engine that accelerates the S8 from 0 to 62 mph in 4.2 seconds with average fuel consumption of 23.29 mpg. The Audi A8 hybrid combines a 2.0 TFSI and electric motor to produce a system output of 245 horsepower with power going to the front wheels via a modified tiptronic. The lithium-ion battery in the rear enables purely electric driving at up to 62.14 mph with a range of roughly 1.86 miles. The A8 hybrid gets about 37.34 mpg. The 2014 Ford F-150 STX SuperCrew, positioned between the XL and XLT models, comes standard with a 302-horsepower 3.7-liter V6 engine, delivering an EPA-estimated 17 mpg city and 23 mpg highway. A 5.0-liter V8 rated at 360 horsepower and 380 lb.-ft. of torque is also available. MSRP for the STX SuperCrew starts at $34,240 (including $1,095 destination charges) for the 4x2 version with 3.7-liter V6 and $38,665 for the 4x4 with 5.0-liter V8. Current available discounts reduce the final price of the STX Sport Package, and F-150 Equipment Group 201A featuring the Trailer Tow Package, SYNC® voice-activated controls and SiriusXM Satellite Radio, to $980. The 2014 Chevrolet Malibu LS with the base 196 horsepower 2.5L engine including stop/start technology as standard and mated to a new six-speed transmission will get an EPA-estimated 25 city and 36 highway mpg, a 14 percent improvement in city fuel economy, at a starting price of $22,965 (including the $825 destination charge). The 2.5L engine base powertrain starts at $24,335 for the 1LT, $26,040 for the 2LT and $28,515 for the top LTZ trim. There's also an available 259 horsepower 2.0L turbo engine. Stop/start technology automatically shuts off the engine when the car comes to a stop and automatically restarts when the driver takes his or her foot off the brake. During engine restarts, an auxiliary 12-volt battery powers electric accessories. The 2014 Chevrolet Malibu will be arriving in dealerships this Fall. 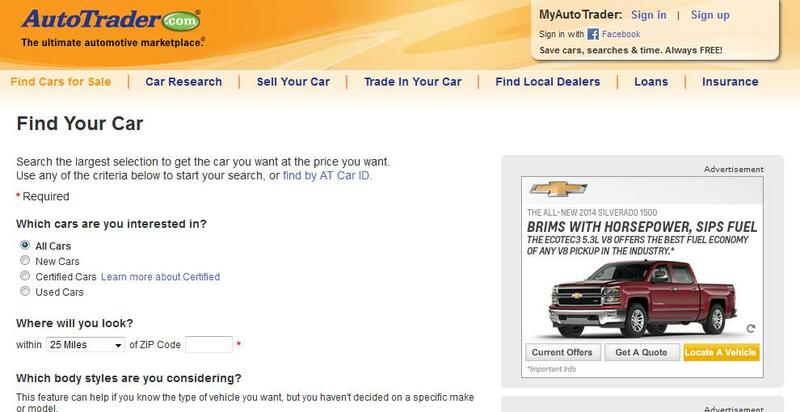 Over 2.1 million unique visitors interacted with AutoTrader.com from a smart phone last month, a 60 percent increase year-over-year, setting a new record for AutoTrader.com. The number of unique visitors to the core AutoTrader.com site also increased 13 percent year-over-year in July, bringing the total to just over 17.7 million unique visitors, an increase of 17 percent over the same time last year. The revised 2013 Ford C-MAX Hybrid label will carry an EPA combined fuel economy value of 43 mpg topping the combined label value of 42 mpg for the Toyota Prius v. Ford is changing the way it tests and labels the 2013 C-MAX Hybrid for fuel economy to better match performance and improve customer satisfaction. Because this voluntary step results in miles-per-gallon values different from the original C-MAX Hybrid label, Ford also is making a goodwill payment to current C-MAX Hybrid owners for the estimated average fuel cost of the difference between the two labels. Customers who purchased their vehicle will receive a check from Ford for $550. Customers who leased their vehicle will receive a check for $325. Ford said it's upgrading the 2014 Ford C-MAX Hybrid with powertrain software that will result in a more efficient transmission drive ratio, a new hood seal, front and rear tire deflectors, A-pillar moldings and the addition of rear lift gate deflectors to improve vehicle aerodynamics and new engine oil with reduced friction. The enhancements to the 2014 C-MAX Hybrid, which goes on sale in December, are expected to improve customers’ on-road fuel economy, especially at highway speeds. Ford sold 53,014 electrified vehicles through July, up 392 percent from a year ago with two-thirds of buyers coming from imports. Cadillac Elmiraj Concept is lightweight rear wheel drive four-seat coupe powered by a 4.5-liter twin turbocharged V8 engine delivering an estimated 500 horsepower. The engine takes the baseline technology from the new Cadillac Twin Turbo V6 featured in the upcoming 420horsepower 2014 CTS Vsport edition and expands it to the V8 engine. The BMW Concept M4 Coupe high-performance sports car. The 2015 GLA-Class powered by a turbocharged 208 horsepower 2.0-liter 4-cylinder engine mated to a 7-speed dual clutch automatic transmission will have the new-generation permanent all-wheel drive system 4MATIC when it arrives in U.S. showrooms in Fall of 2014. 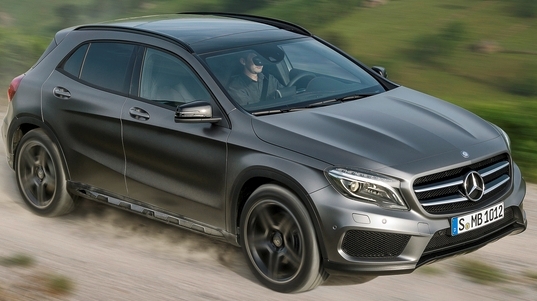 The GLA250 4MATIC sprints from zero to 60 mph in 6.4 seconds and it has a top speed of 145 mph. The front-wheel drive GLA250 will be available in the U.S. in early 2015. The all-new 2015 GLA-Class will have its world premiere at the International Motor Show in Frankfurt in September. 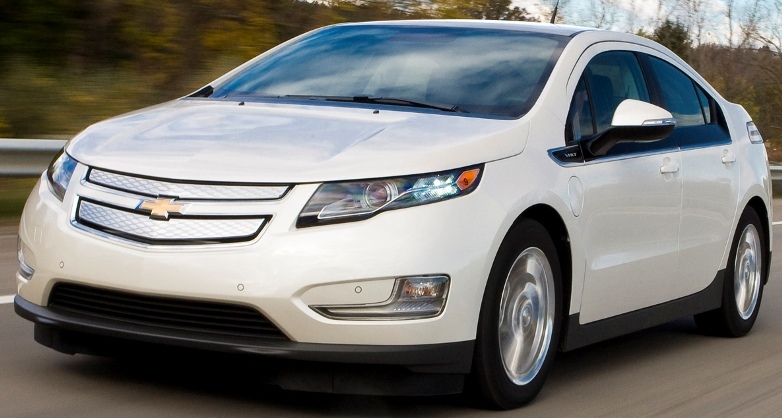 The 2014 Chevrolet Volt, which allows gas-free driving for an EPA-estimated 38 miles, will start at $34,995, (including an $810 destination fee), $5,000 less than the previous model. With federal tax credits ranging from $0-$7,500 (depending on individual tax liability), pricing could start at $27,495. The 2014 Volt will start to be available in dealer showrooms late this summer and in two new colors – Ashen Gray Metallic and Brownstowne Metallic for the 2014 model year – and a leather-wrapped steering wheel. Tesla reported, in a letter to shareholders, that its second quarter income was $26 million, an increase of 70 percent from last quarter's $15 million, on revenues of $551 million, driven by record Model S deliveries and a significant improvement in automotive gross margin. 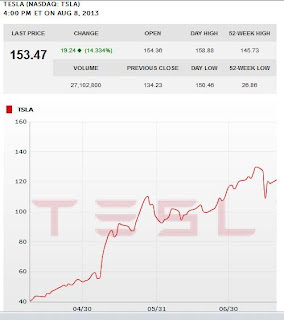 Tesla's stock went public just over 3 years ago on June 29, 2010 at $17 a share, opened at $19, and, after a whipsaw session closed $23.89, a 40 percent first session gain on a day when the Dow fell 268 points to 9,870. 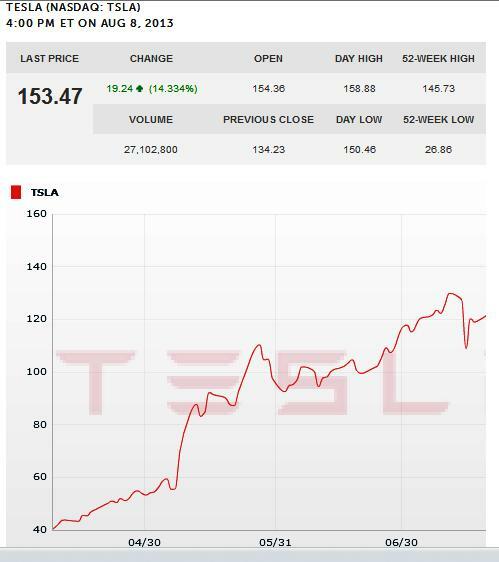 Since then Tesla's stock has rallied to nine times its IPO price. Kick your rear bumper unless you loaded up on virtually any stock that day. Over 13,000 Model S customer vehicles are now on North American roads and have logged nearly 60 million miles, according to today's report. Tesla's production rate grew by 25 percent from 400 to almost 500 vehicles per week with 5,150 cars delivered during the quarter, significantly surpassing the company's expectation of 4,500 deliveries. Global Model S demand continues to grow, driven by Tesla's geographic expansion and enhancements to both the product and ownership experience. North American deliveries outside Tesla's home state of California grew at twice the rate of California deliveries this quarter. Deliveries into Europe began this week, with the first cars arriving in Norway, Switzerland and the Netherlands. In Norway alone, almost 800 vehicles are expected to be delivered this year based on current orders. Orders from Europe have grown every month since February. If demonstrated demand in North America and Europe is matched by similar demand in Asia, annualized sales for Model S could exceed 40,000 units per year by late 2014. Tesla's goal is to make recharging Model S as fast and as convenient as possible to enable worry-free long distance driving. Tesla is rolling out 120 kW Superchargers, which are 33 percent faster than the current version and can replenish half a charge in just 20 minutes, for free. 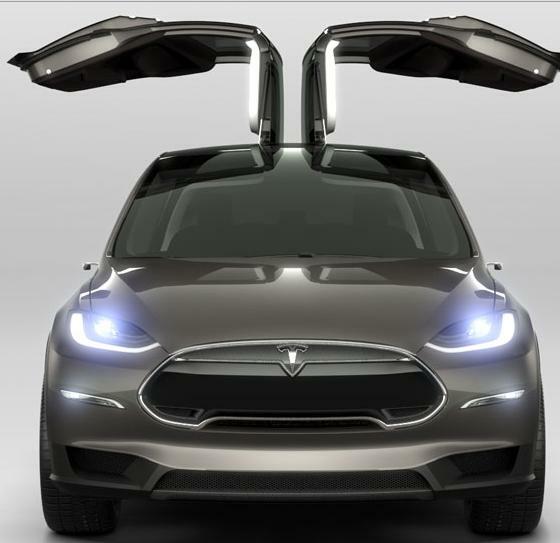 The Tesla Model X, with 0 to 60 mph acceleration in less than 5 seconds and falcon wing doors for easy third row access, will go on sale in 2014 and be priced comparable to a similarly equipped Model S.
The BMW i8 has a curb weight of less than 3,285 lbs with its battery pack situated low down in the middle of the vehicle, resulting in a low and central center of gravity, which improves safety. In the US a full recharge takes approximately 3½ hours from a conventional 120 volt, 12 amp household circuit or approximately 1½ hours from a 220 volt Level 2 charger. 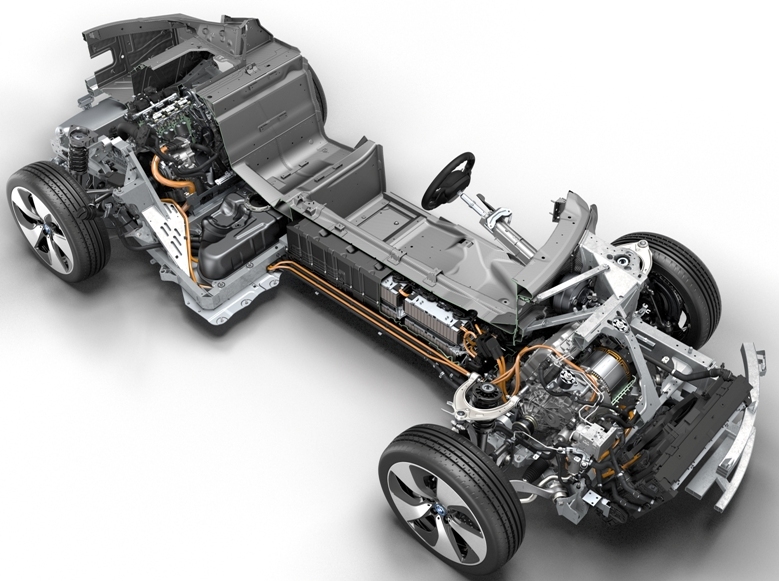 The BMW i8 will make its world debut at the Frankfurt Auto Show next month and arrive in BMW showrooms in 2014. General Motors delivered 234,071 vehicles in the United States in July, up 16.3 percent compared with a year ago. 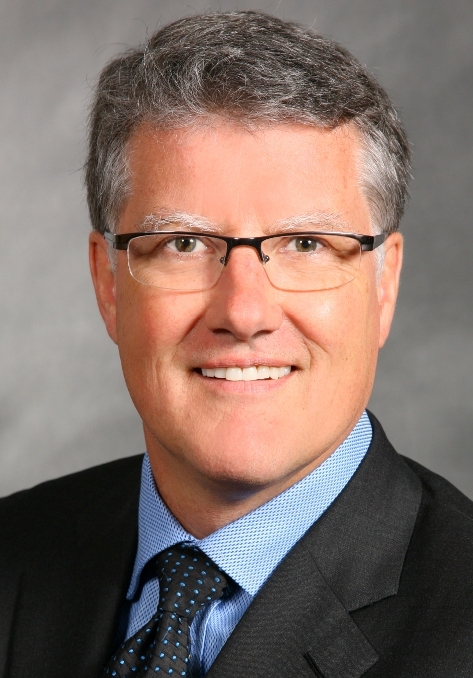 Retail sales increased 23 percent while fleet sales declined 6 percent. Year-to-date total GM sales are 1,654,417, up 9.1 percent over 2012. Ford Motor Company sold 193,715 vehicles in July, an 11.4 percent increase over July of last year and year-to-date Ford sales are 1,487,010, up 12.9 percent through the first seven months of this year over 2012. Toyota Motor Sales U.S.A. reported July 2013 sales results of 193,394, an increase of 17.3 percent from the year-ago month.Year-to-date sales are 1,302,185, a 7.5 percent increase over 2012. The Toyota division sold 170,363 vehicles in July, up 11.5 percent for a year-to-date total of 1,160,739, a 7 percent gain over last year. Lexus division sales were 23,031 in July, up 26.3 percent and year-to-date Lexus sales are 141,446, a rise of 11.9 percent over last year. American Honda reported July 2013 U.S. sales of 141,439, an increase of 20.9 percent compared with July 2012. The Honda Division posted July 2013 sales of 126,289, an increase of 21.3 percent compared with July 2012. Acura Division U.S. July sales of 15,150 was an 18.1 percent compared with July 2012. Chrysler reported July U.S. sales of 140,102, an 11 percent increase compared with sales in July 2012 and the best July sales since 2006. Year-to-date sales are 1,048,434, a 9 percent increase over the first seven months of last year. Nissan set a new July record with U.S. sales of 109,041 deliveries, an increase of 10.9 percent over a year earlier. Nissan Division also set a new July record with 101,279 sales, up 16.8 percent and year-to-date, Nissan sales are 673,755, up 10.4 percent. Infiniti sales in July totaled 7,762, a 33.2 percent drop from last year and 2013 Infiniti sales are 59,995, a decline of 9.1 percent. Hyundai Motor America reported July sales of 66,005, a 6.4 percent gain over 2012 for its best ever July sales. Year-to-date sales are 427,015, up 2 percent over the first seven months of 2012. Kia Motors America reported record July sales of 49,004 vehicles, a 1.9 percent increase over the same period in 2012. Year-to-date, Kia sales are 326,355, a 3 percent decline from 2012. Volkswagen of America reported 35,779 vehicles delivered in July, a 3.3 percent decrease over prior year sales and year-to-date sales of 242,571, a 1.3 percent decrease versus the prior year. Separately, Audi reported July 2013 sales of 13,064 vehicles, an 11.6 percent increase over the previous July record set last year. Audi sales YTD increased 13.6 percent to 87,341 vehicles sold. Subaru of America reported July sales of 35,994, a 43 percent increase over July 2012 with the best-ever July sales for the Forester, Outback and Impreza models. Year-to-date sales for Subaru total 240,591, 27 percent higher than the same period in 2012. The BMW Group in the U.S. (BMW and MINI combined) reported July sales of 29,993 vehicles, an increase of 10.5 percent from the same month a year ago. Year-to-date, the BMW Group (BMW and MINI combined) is up 9.2 percent on sales of 202,780 in the first seven months of 2013 compared to the same period in 2012. Mercedes-Benz USA (including Sprinter Van and smart car) reported July sales of 26,423, an 18.5 percent increase over July 2012 while year-to-date sales were 182,315, a 10.6 percent gain over last year. The Mercedes-Benz brand July sales were 23,648, up 22.5 percent over last July and year-to-date sales hit an all-time high of 165,598, a 12 percent65,598, a 12 percent rise over 2012. Mazda North American Operations reported July U.S. sales of 24,977 vehicles, an increase of 29.4 percent versus last year. Year-to-date sales through July are up 4.2 percent versus last year, with 169,920 vehicles sold. Volvo Cars of North America reported U.S. sales of 5,909, a 3.4 percent increase month-over-month and the best July since 2009. 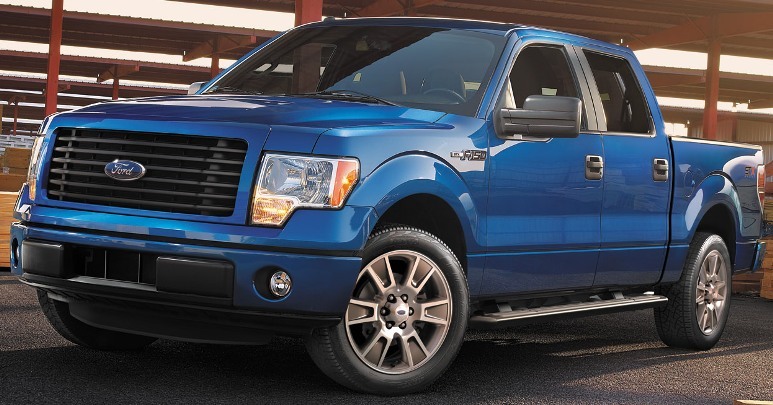 Year-to-date sales are 38,487, down 4.6 percent over the first seven months of 2012. Jaguar Land Rover North America July U.S. sales for both brands hit 5,663, a 31 percent increase from 2012. Jaguar July sales were 1,613, up 60 percent from 2012 with year to date Jaguar sales 9,411, up 25 percent. Land Rover sales were 4,050, up 22 percent from 2012. Year to date through July, Jaguar Land Rover North America is up 15 percent, with Land Rover up 11 percent. Mitsubishi Motors North America reported July sales of 5,230, an increase of 24.7 percent compared to July 2012. Porsche Cars North America announced July 2013 sales of 3,820 vehicles, an increase of 36 percent over July 2012. For the year, Porsche has sold 25,129 cars in the U.S., a 31 percent increase over last year. The Los Angeles Auto Show, the first major North American auto show of the season, expects more than 50 vehicle debuts to be unveiled including seven to eight BMW vehicles with a yet-to-be-named global premiere and a brand-new MINI automobile. Chevrolet, Honda, Mercedes-Benz, Subaru and Volkswagen have confirmed worldwide debuts while Porsche has officially announced that it will introduce the Macan SUV crossover.